It's my husband's birthday this weekend! I love it when other people have birthdays so I can bake something for them! This cookie cake actually isn't for him. I have something extra special in mind for him (he love ice cream cake). But for a coworkers birthday I tried making my very first cookie cake. Honestly, I was a little intimidated. I have never made a cookie cake before and my expectation was that it would bake unevenly. The edges would be burned and the middle would be soft. But I did some research and found some great tips for making the perfect cookie cake. I consulted several recipes. This recipe from Sally's Baking Addiction looks awesome. So does this one from Divas Can Cook. What I learned from both of these recipes is that the secret to the prefect cookie cake is moisture. You want to create a soft, chewy cookie. Not a crispy cookie. So I ended up taking my favorite chocolate chip cookie recipe and tweaked it a tad based on what I learned. Oh....and I added lots of sprinkles! Then I added some super simple butter cream icing (with extra sprinkles) for good measure. I used this recipe. Ta-da! Cookie cakes no longer intimidate me. 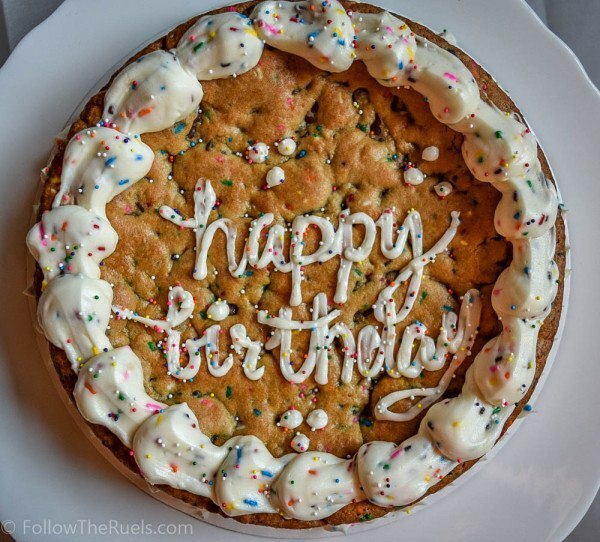 Actually, cookie cake my be my go to birthday baked-good. So much simpler than a cake or cupcakes! Preheat oven to 350 degrees and prepare a 9" cake pan. I prefer to line the bottom with parchment. In a bowl of a stand mixer fitted with the paddle attachment, cream together butter, yogurt, and sugar. Mix in egg, yolk, and vanilla. In a separate bowl, whisk together flour, baking soda, and salt. Gradually mix in flour into the butter mixture until combined. Fold in chocolate chips and sprinkles. Dump cookie dough into cake pan and press out so that it is evenly distributed and level. Bake for 22 to 25 minutes or until edges start to crisp and top is golden brown. Let cool to room temperature before removing from the pan. Decorate with icing and sprinkles of your choosing.